Love-n-Stitches is my home to showcase my love of quilting. 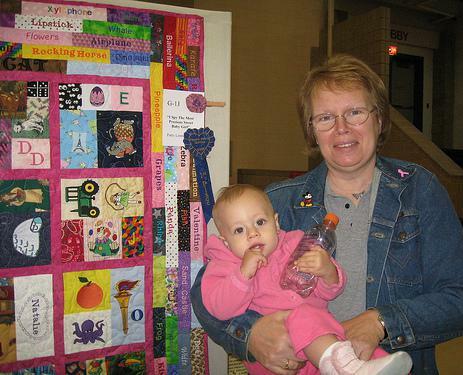 I have been quilting for 41 years! WOW that's a long time! My business includes: designing and piecing quilts, machine quilting, finishing semi-completed quilts, memory quilts, t-shirt quilts, machine and hand piecing quilts, kings, queens/doubles/singles/throws and baby blankets,wall hangings, pillows, sweatshirt jackets, machine embroidery, quilt restoration and repair, quilt kits, fabric packs, and patterns. I work with Girl Scouts and other organizations to make pillow cases for pediatric cancer patients at the local Childrens Hospital. I am also involved with a charity Veterans Quilt project. 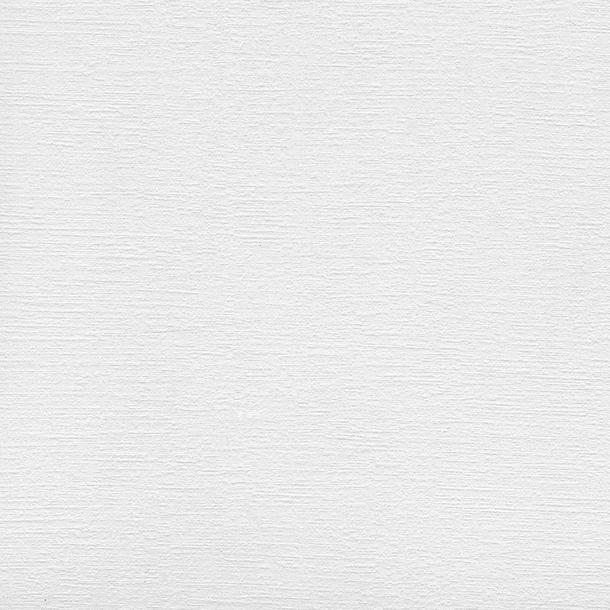 If you have any questions or quilting needs, please email me! This quilt is a larger throw quilt made with florals and prints in purples/blues. The is one of my original designs and features 7 embroidered lighthouses. This quilt has already been given to a very happy couple celebrating their 40th wedding anniversary in Myrtle Beach which is where this picture was taken. What a great way to remember this special day!! 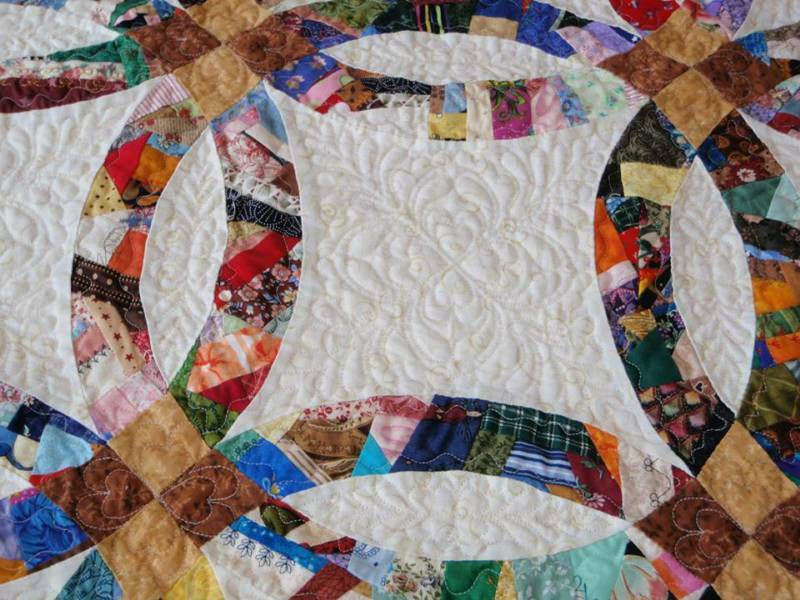 Did you, your Mom, or your Great Grandmother start a quilt and run out of time or energy? Bring the pieces (and all the fabric you can find) to me and I can help you finish the quilt. This quilt is titled "I Spy the Most Precious Sweet Baby Girl". I entered the quilt in the Pieceful Hearts Quilt Show and it won a 1st place blue ribbon! I am holding Natalie Claire, my 1st grandbaby!!! The love of words and reading is the best gift I can give to her.....well...the quilt is pretty neat too. Very unique layout. 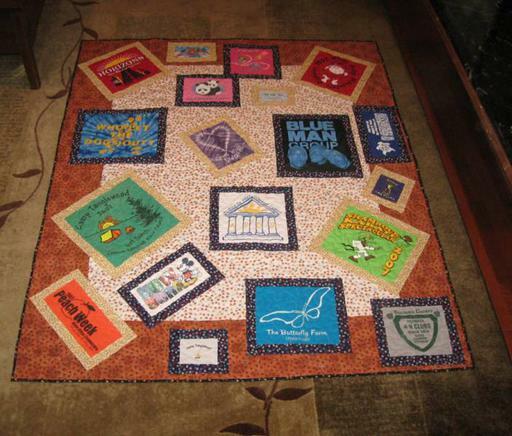 Click on the tab at the top of this page titled "TShirt Quilts" to see more examples of neat ways to use all of the tshirts you have saved over the years. See more tshirt quilts on my tshirt quilt tab. 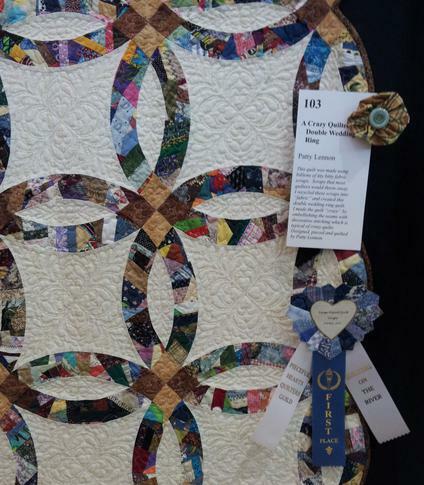 My "Crazy Quilted Double Wedding Ring" quilt won a Blue Ribbon! Over about 18 months, I took literally zillions of itty bitty fabric scraps and stitched them together to make this quilt. I then embellished it with decorative embroidery stitches. 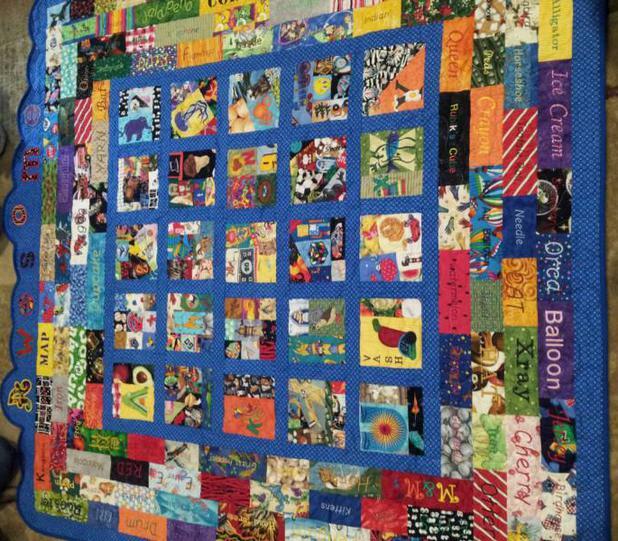 This quilt has a block for every letter in the alphabet filled with pictures (i.e. 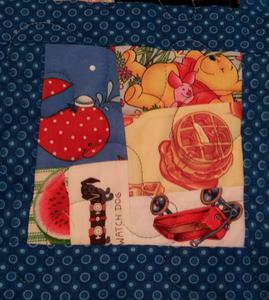 the "W" block has a waffle, wagon, watermelon, watchdog, whale, and Winnie the Pooh. Then each and every word is embroidered in the border. The love of words and reading is the best gift to give a child!! **You can buy premade Crazy Quilt "fabric" from my shop to make your very own Crazy Quilted quilt! ** You can purchase fabric packs in My Store to get a great start on your I Spy or Alphabet quilt!! **Would you like a quilt just like this in your choice of colors? Call or drop me a note and we can talk about your project. This is a "fusion" quilt. I have embroidered Baltimore Album designs and added them to a Double Wedding Ring quilt! 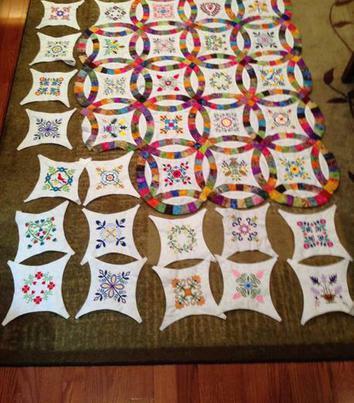 The quilt will be called "A Wedding in Baltimore"! It is going to be a show stopper! This will be a full size quilt when finished.